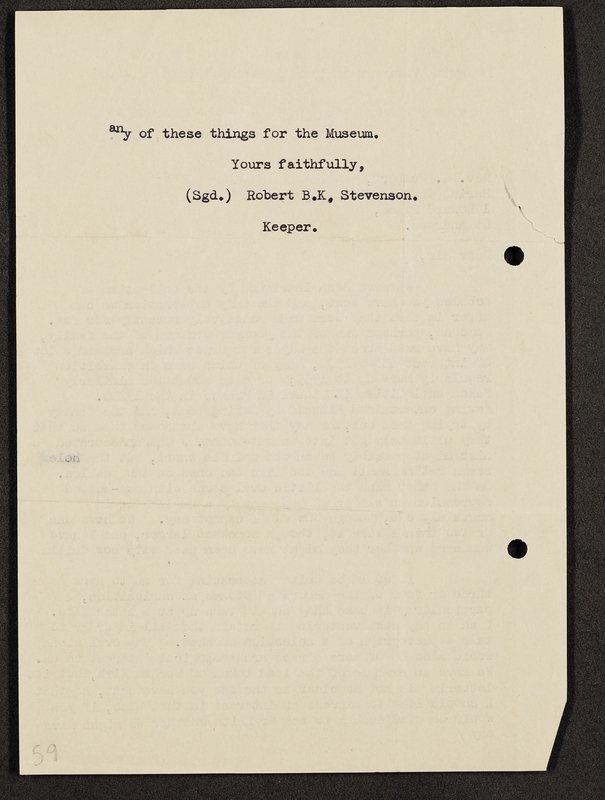 These letters, especially the letter from Hulbert to the Bancroft Library, explain the provenance of the GD316 collection. The letters have been arranged in chronological order. 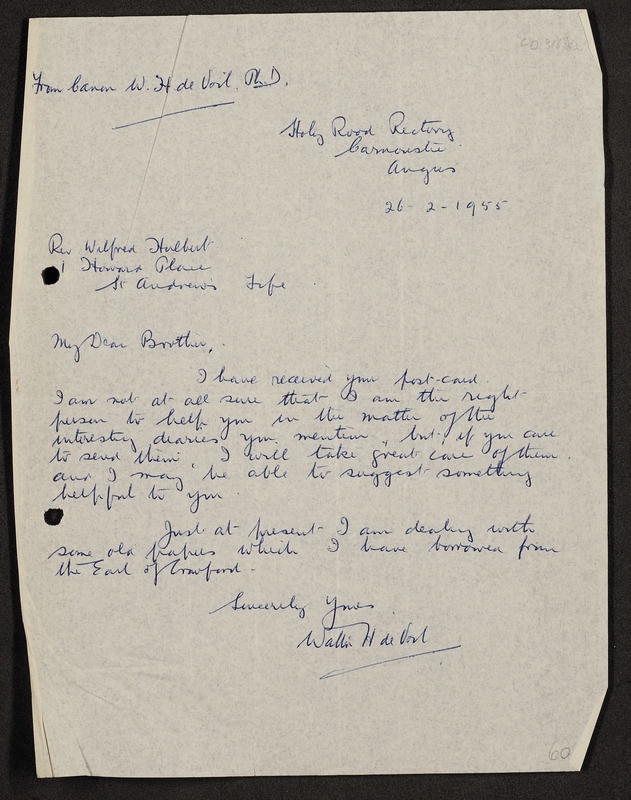 This is a letter from Canon Walter H. de Voil to Rev. Hulbert, dated 26 Feb 1955. It suggests a longstanding interest by Hulbert in antiquities and historical documents. I have received your postcard. I am not at all sure that I am the right person to help you in the matter of the interesting diaries you mention, but if you care to send them, I will take great care of them and I may be able to suggest something helpful to you. Just at present I am dealing with some old papers which I have borrowed from the Earl of Crawford. 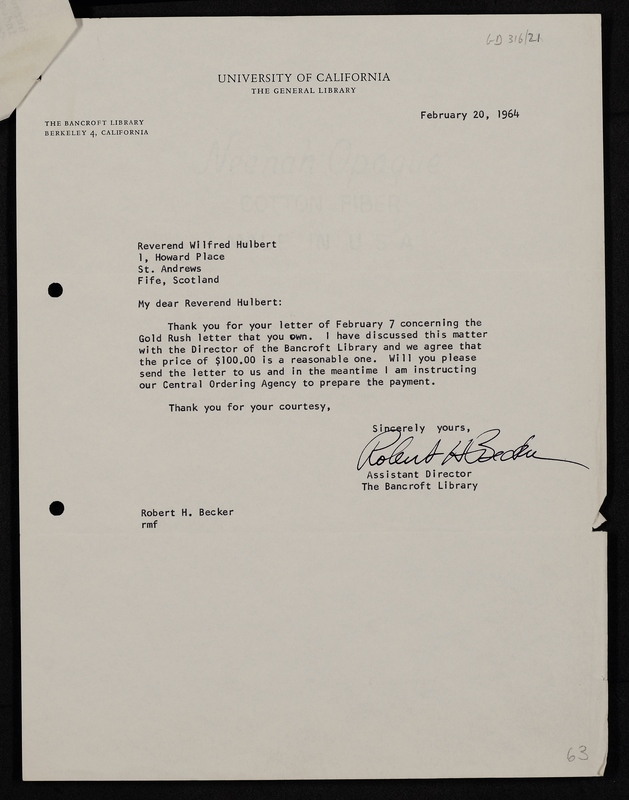 This is a letter from the Assistant Director of the Bancroft Library at UC Berkeley, accepting Hulbert’s offer to sell them a “Gold Rush letter” for $100 (explained further in the next letter). 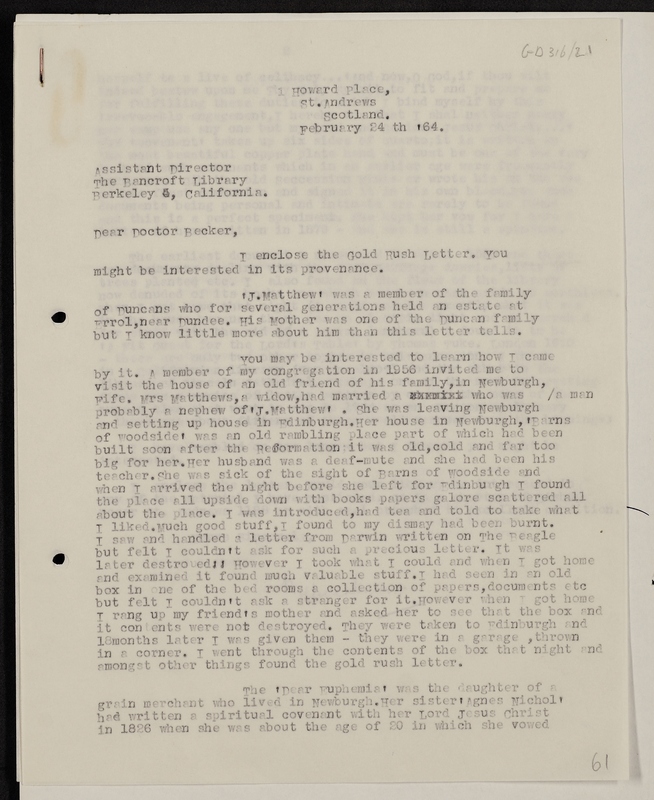 Thank you for your letter of February 7 concerning the Gold Rush letter that you own. I have discussed this matter with the Director of the Bancroft Library and we agree that the price of $100.00 is a reasonable one. Will you please send the letter to us and in the meantime I am instructing our Central Ordering Agency to prepare the payment. 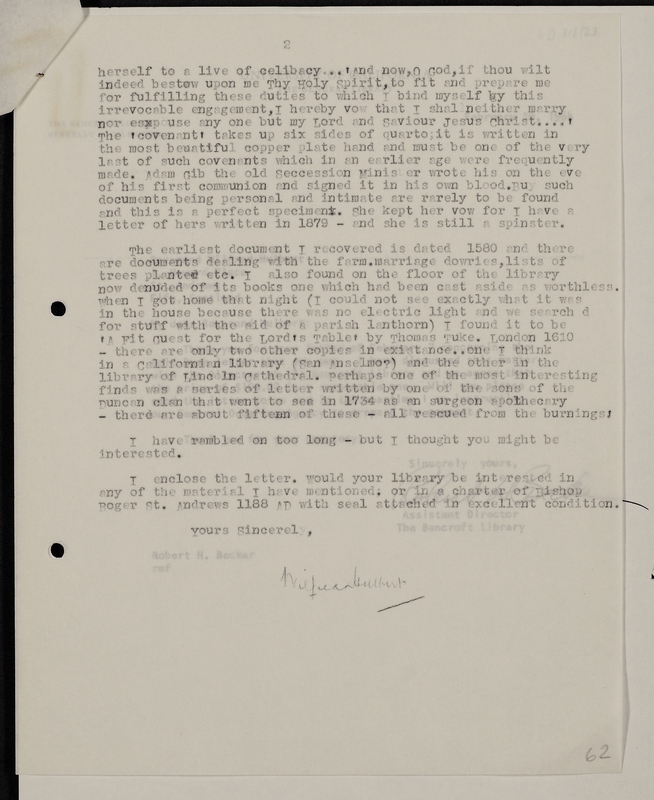 This is a letter from Hulbert to the Assistant Director of the Bancroft Library at UC Berkeley, enclosing “the Gold Rush letter”. It provides important details on the provenance of GD316. See also Notes on GD316 Provenance. I enclose the Gold Rush Letter. You might be interested in its provenance. ‘J. Matthew’ was a member of the family of Duncans who for several generations held an estate at Errol, near Dundee. His mother was one of the Duncan family but I know little more about him than this letter tells. You may be interested to learn how I came by it. A member of my congregation in 1956 invited me to visit the house of an old friend of his family, in Newburgh, Fife. Mrs Matthews, a widow, had married a man who was probably a nephew of ‘J. Matthew’. She was leaving Newburgh and setting up house in Edinburgh. Her house in Newburgh, ‘Barns of Woodside’ was an old rambling place part of which had been built soon after the Reformation; it was old, cold and far too big for her. Her husband was a deaf-mute and she had been his teacher. She was sick of the sight of Barns of Woodside and when I arrived the night before she left for Edinburgh I found the place all upside down with book papers galore scattered all about the place. I was introduced, had tea and told to take what I liked. Much good stuff, I found to my dismay had been burnt. I saw and handled a letter from Darwin written on The Beagle but felt I couldn’t ask for such a precious letter. It was later destroyed!! However I took what I could and when I got home and examined it found much valuable stuff. I had seen in an old box in one of the bed rooms a collection of papers, documents etc but felt I couldn’t ask a stranger for it. However when I got home I rang up my friend’s mother and asked her to see that the box and it[s] contents were not destroyed. They were taken to Edinburgh and 18 months later I was given them – they were in a garage, thrown in a corner. I went through the contents of the box that night and amongst other things found the gold rush letter. The ‘Dear Euphemia’ was the daughter of a grain merchant who lived in Newburgh. Her sister ‘Agnes Nicol’ had written a spiritual covenant with her Lord Jesus Christ in 1826 when she was about the age of 20 in which she vowed herself to a life of celibacy… ‘And now, O God, if thou wilt indeed bestow upon me Thy Holy Spirit, to fit and prepare me for fulfilling these duties to which I bind myself by this irrevocable engagement, I hereby vow that I shall neither marry nor espouse any one but my Lord and Saviour Jesus Christ….’ The ‘covenant’ takes up six sides of quarto; it is written in the most beautiful copper plate hand and must be one of the very last of such covenants which in an earlier age were frequently made. Adam Gib the old Secession Minister wrote his on the eve of his first communion and signed it in his own blood. Buy [sic] such documents being personal and intimate are rarely to be found and this is a perfect specimen. She kept her vow for I have a letter of hers written in 1879 – and she is still a spinster. The earliest document I recovered is dated 1580 and there are documents dealing with the farm, marriage dowries, lists of trees planted etc. I also found on the floor of the library now denuded of its books one which had been cast aside as worthless. When I got home that night (I could not see exactly what it was in the house because there was no electric light and we searched for stuff with the aid of a parish lanthorn) I found it to be ‘A Fit Guest for the Lord’s Table’ by Thomas Tuke. London 1610 – there are only two other copies in existence .. one I think in a Californian library (San Anselmo?) and the other in the library of Lincoln Cathedral. Perhaps one of the most interesting finds was a series of letter[s] written by one of the sons of the Duncan clan that went to sea in 1734 as a surgeon apothecary – there are about fifteen of these – all rescued from the burnings! I have rambled on too long – but I thought you might be interested. I enclose the letter. Would your library be interested in any of the material I’ve mentioned, or in a charter of Bishop Roger St. Andrews 1188 AD with seal attached in excellent condition. 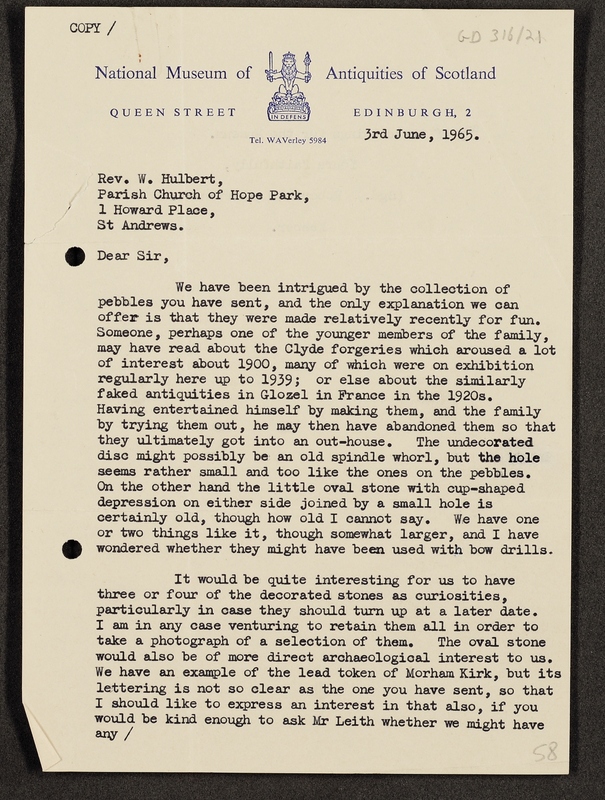 This is a letter from the Keeper of the National Museum of Antiquities of Scotland to Hulbert, regarding a “collection of pebbles” that Hulbert had sent them. It is unclear whether this has anything to do with the other Matthew family materials, but it confirms Hulbert’s interest in antiquities. We have been intrigued by the collection of pebbles you have sent, and the only explanation we can offer is that they were made relatively recently for fun. Someone, perhaps one of the younger members of the family, may have read about the Clyde forgeries which aroused a lot of interest around 1900, many of which were on exhibition regularly here up to 1939; or else about the similarly fake antiquities in Clozel in France in the 1920s. Having entertained himself by making them, and the family by trying them out, he may then have abandoned them so that they ultimately got into an outhouse. The undecorated disc might possibly be an old spindle whorl, but the hole seems rather small and too like the ones on the pebbles. On the other hand the little oval stone with cup-shaped depression on either side joined by a small hole is certainly old, though how old I cannot say. We have one or two things like it, though somewhat larger, and I wondered whether they might have been used with bow drills. It would be quite interesting for us to have three or four of the decorated stones as curiosities, particularly in case they should turn up at a later date. I am in any case venturing to retain them all in order to take a photograph of a selection of them. The oval stone would also be of more direct archaeological interest to us. We have an example of the lead token of the Morham Kirk, but its lettering is not so clear as the one you have sent, so that I should like to express an interest in that also, if you would be kind enough to ask Mr Leith whether we might have any of these things for the museum.